How can I be sure that Peek polish is the best? Peek has been used by millions since the beginning. In 2005 Tri-Peek International Limited in Great Britain was granted the Royal Warrant from Buckingham Palace, which is only bestowed on a very few companies. Peek stands out as a company with documentation; its customers. Peek is superior on a wide range of surfaces. Peek has enjoyed consistent quality since its inception. The use is simple; the results conclusive Peek's easy wipe-on wipe-off formula cleans, polish, protects and restores a deep rich shine on all metals and fibreglass. Peek quality is second to none. Has been used in the Royal Household for years and on the Royal Yacht Britannia. What are the surfaces that Peek Polish works on? ALL Metals, Fibreglass, Perspex, Eisenglass, mirrors, clouded glass and crystal, leaded glass, ceramics and ceramic tile, porcelain, enamel, granite, marble, laminates and Formica, linoleum, plastic convertible windows, plastics, Plexiglas, Lexan, acrylic, powder coating, auto and aircraft paint (to remove stains and buff out surface scratches), solid vinyl, polyurethane; all non-porous surfaces. Why is the tarnish not coming off brass, copper? If Peek does not instantly remove tarnish this indicates the item is lacquered. All you should use is a damp cloth unless you want to remove the lacquer. To do that purchase a lacquer remover from your local DIY store. How can I tell if a metal is plated and how do I clean them? Always read manufacturers recommendations regarding plated metals. Solid silver and gold are stamped indicating it is a solid metal. For brass and copper, place a magnet on the metal. If it holds to the metal it is plated. Manufacturers of plated metals do not recommend using polishes; often the plating is painted on and is paper-thin; these surfaces cannot withstand any cleaning solutions. Quality plated silver can be polished with Peek Polish. If you are unsure of the quality of your silver we recommend testing on an inconspicuous area. Plated metals must be gently wiped with a very soft cloth; use very little pressure; hard rubbing will remove plating even without using cleaning products. Peek is safe for chrome plating. Use a very soft cloth to remove discolouration. What do you recommend for brushed stainless steel and chrome? 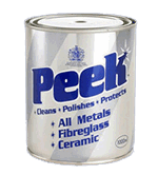 For brushed stainless steel and aluminium use Peek liquid or Peek foam. To restore stained and badly discolored smooth stainless steel surfaces and chrome carefully apply Peek Polish with a damp or dry cloth then polish off with a soft cloth. DO NOT LET DRY. For brushed stainless steel, gently wipe in the direction of the brush marks using Peek Liquid Metal Polish. Wipe with a damp clean cloth and dry to ensure all residues are removed. Can your product be used for polishing aluminium, magnesium, chrome, alloy wheels? Peek polish safely restores tarnished and damaged metals: chrome, aluminium, magnesium, and alloy wheels. On what metals can you use Peek? Brass, copper, silver, gold, aluminium, chrome, magnesium, diamond plate, stainless steel as well as many other metals excluding anodized and lacquered metal. Can you use Peek on fibreglass? Yes Peek cleans and polishes exceptionally well. Best to use with a buffer at low speed. How long does Peek last? Peek retards tarnish up to 3 months or more depending on the environment. Does Peek work on dull painted surfaces on a car or a plane? Can Peek be used on food surfaces? Yes Peek is NSF certified. 1.Apply Peek® sparingly. Do not let dry. Rub briskly on surface to be cleaned, using a dry or damp cloth. 2.On large surface areas, Peek® may also be applied using a low-speed buffer (under 1000RPM). 3.On intricate surfaces, Peek® may be applied using an old toothbrush surrounded by your polishing cloth. 4.On minor rust or stubborn deposits, Peek® may be applied with a nylon scouring pad or #0000 brnze/stl wool.